How Fast Does a Rabbit Run? 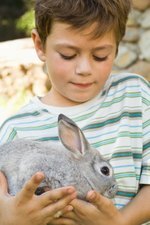 The American Rabbit Breeders Association recognizes 48 breeds of rabbits, each with its own speed and agility. However, the average bunny can run anywhere from 25 to 45 mph. The top speed is achieved by jackrabbits, which are technically hares and have extremely long legs. The wild cottontail rabbit, which is more like domesticated rabbits, can reach speeds of 35 mph, but usually doesn't go faster than 30 mph. Even though a domesticated rabbit is capable of running as fast as a cottontail, the wild cousin does it for survival on a daily basis. Pet rabbits aren't used to running that fast. It can be dangerous to force your bunny to run at his highest speed. The reason rabbits can run so fast is because they have strong back legs and long feet. Bunnies are better known for hopping. They can easily and quickly leap forward by pushing off from both powerful back legs simultaneously, reaching a distance of 10 feet and a height of 4 feet in a single hop. When a rabbit is happy it will 'binky,' which is a twisting leap in the air followed by a flick of the feet. Besides running and jumping, the rabbit uses his big, strong feet for self-defense. When threatened by a predator, the rabbit will give it a swift kick as a warning to back away. He also will thump his legs on the ground as a warning sign to other rabbits that danger is near. Domestic rabbits also do this, even though their chances of being eaten by another animal are slim.